A couple months later Howard City became Howard and was established as a third class city through district court action. The first mayor was Abe Steinberger, who had brought the Courant newspaper to Howard City. 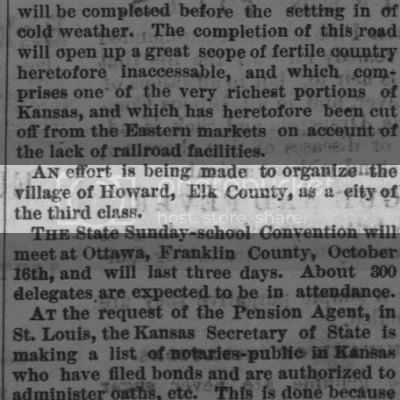 The other larger villages in Elk County eventually followed suit and all existing remain as a third class city. Population determines the class status of a city but once established, a city cannot lose its status even if the population should drop dramatically.